The vent blower motor is mounted on the wall. This keeps the heat of the kiln away from the motor (for long motor life) and keeps the motor vibration away from the kiln (which can cause ware to move, damage to the kiln, and misfiring of cones on a Dawson Kiln Sitter). The vent tubing is kept under vacuum instead of pressure (unlike competitive brands). This insures that any leak in the tubing does not blow noxious fumes into your room. External venting is safer and surer than venting to the inside of your kiln room with a filter. The blower vents up to 130 CFM (cubic feet per minute). This will handle up to a 20 cubic foot kiln (and usually larger). More than one vent can be attached to a kiln. Only 1.37 amps. A vacuum bypass on the kiln bypass/collection box adjusts the amount of venting from the system. Don't waste heat and energy by venting more than you need. Adjust vent to kiln size. 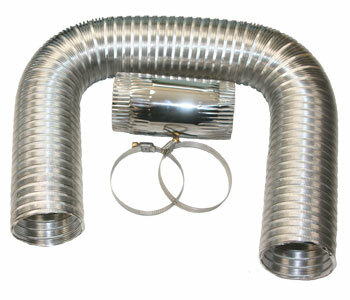 15 feet of flexible expandable aluminum 3" diameter duct is included along with necessary hose clamps. Longer lengths or lengths of 3" stove pipe can be used as well. Length can be as great as 60 feet horizontal or vertical with up to three 90 degree bends. 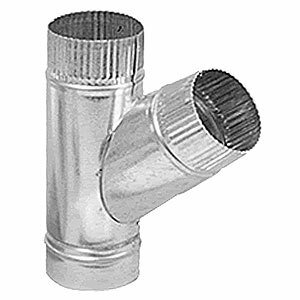 This accessory allows you to connect two kilns to a Vent-Sure vent system. It can be added to an existing vent system or can be ordered with a new vent. Includes: (1) galvanized "T" duct fitting with dampers with self drilling screws, (1) extra collection box with slide damper, (1) extra 15' flexible aluminum duct (one is included with the Vent-Sure), (2) clamps per flexible duct assembly one wall/floor bracket. Now you can vent 2 Kilns with one vent. The new 140 CFM Motor allows you to vent 2 kilns up to 12 Cubic Feet each, or one kiln between 12 and 24 Cubic Feet, with one Envirovent 2 Motor. The new design is wall mounted. This moves the vent motor away from under the kiln so the motor is no longer exposed to the heat and can no longer transfer any vibration into the kiln. As your kiln heats up the brick expands. When it expands the hot face of the kiln floor, the inside, expands more than the cold face or underside. This causes the slab to cup, or become slightly concave on the bottom. The result is that the center of the kiln floor moves upward at higher temperatures. 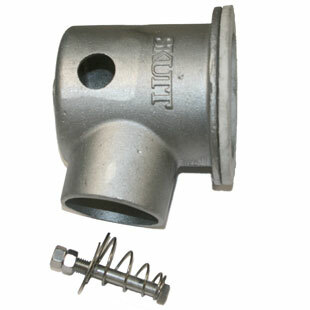 The spring loaded cup follows the floor ensuring a tight seal throughout the firing process. Since the vent is wall mounted it pulls the air through the duct work instead of pushing it. This means if you were to ever form a leak in your duct work the fumes would not be pushed into the room. Now with the purchase of the new Skutt EnviroLink you can control exactly when the Envirovent 2 turns on and off during a firing on a GlassMaster or KilnMaster kiln. A designated number of holes are drilled in the lid and floor of the kiln either in the factory or on location. A spring loaded plenum cup (see diagram) is placed under the kiln and tensioned between the floor of the kiln and the floor under the kiln. The holes in the floor of the kiln are drilled in a tight pattern so the plenum cup can cover them all. 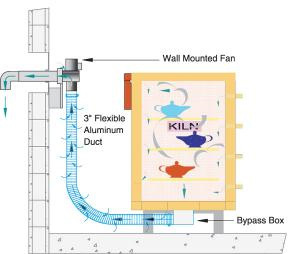 The other end of the cup is connected by 3" ducting to a fan which is generally mounted on the wall. On the opposite end of the fan the air is ducted through the wall to the outside air. The plenum cup has 3 additional holes from which it draws room temperature air to mix with the heated air from the kiln. This serves 2 purposes. Since the kiln air is mixed with cooler room air the air coming out of the end of the vent is never hotter than an average hair dryer. Secondly, the holes in the plenum cup are sized to reduce the vacuum on the kiln chamber so only a small amount of air is moving through the kiln. This ensures the firing time is not affected and the ware is not at risk. 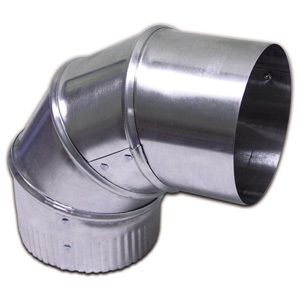 The EnviroVent 2 comes with one 8 ft section of flexible heavy gauge aluminum ducting. 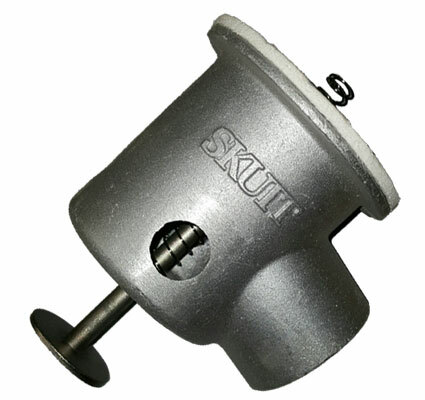 The stand adapter is a bracket that is designed to fit in between the cross supports of your Skutt Rolling Kiln Stand. The EnviroVent2 collection cup is spring loaded so it can move up and down with the bottom of the kiln as the brick expands and contracts. The Envirovent2 Collection Cup with the screw and spring. This model is for mounting the EV2 cup to a rolling kiln stand. This does not include the vent adapter shown above. The Envirovent2 Collection Cup with the plunger and spring. This model is for a floor mounted kiln. This does not include the vent adapter shown above. 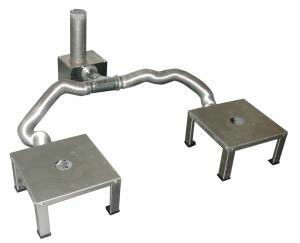 Dual intake kit used for venting two kilns or kilns that are over 12 cubic feet. 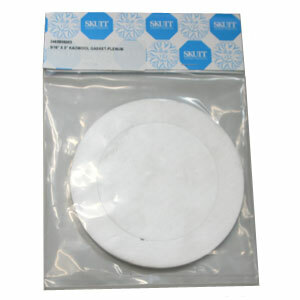 For use with Skutt EnviroVent kiln vents. You can run your ducting up to 60 ft without having to increase the ducting size. 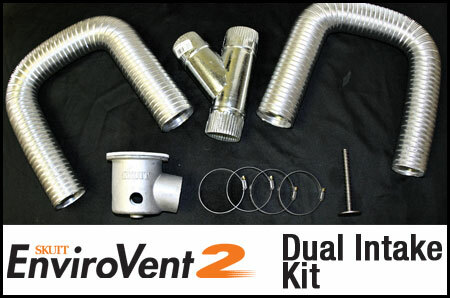 Your EnviroVent 2 comes with one vent hose connector and 8 ft section of flexible heavy gauge aluminum ducting. Additional length can be purchase if needed. is an easy-to-install system designed for the removal of kiln firing emissions. With Vent-A-Kiln, unpleasant fumes, odors, and heat are captured at the source and safely removed from the area. Electric kilns use large quantities of high-current electricity to generate the necessary heat to properly fire artwork. In some instances, internal temperatures can exceed 2200º F. Further, the clay medium experiences a metamorphosis, which can result in toxic and odorous fumes exiting the kiln. These heated fumes can accumulate and create an uncomfortable and dangerous environment to work in. Vent-A-Kiln was the first to create a solution to this problem. By using heat's natural tendency to rise, fumes and heat are safely exhausted away from the work area. This allows the craftsman to create new work while firing ready pieces. Please measure the exterior dimension of your kiln and choose among the following systems that best fit your size. Remember, if you have a square, rectangular or oval kiln, you must measure the longest dimension; that is, corner to opposite corner. Round or multi-faced kilns need only have the diameter measured. Expansion Kit allows you to add another kiln at a fraction of the cost of a new vent. 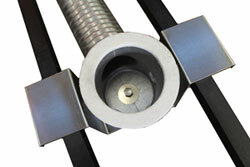 Vent Master Extender Hose Kit extends the distance between the blower motor and the collector cup.